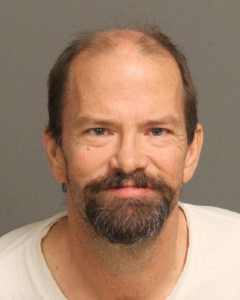 An Atascadero man who, in emotional distress, fired shots and engaged in a standoff with police on Sunday has been identified as 53-year-old John Floyd Jones, according to San Luis Obispo County Jail records. Jones is still in jail, as of Tuesday morning, with bail set at $500,000. He is charged with shooting at an inhabited dwelling or vehicle and assault with a semiautomatic rifle on a police officer. Early Sunday morning, Atascadero police responded to Jones’ apartment on Santa Ysabel Avenue near Curbaril Avenue after receiving a call saying he was under mental distress. Officers determined he did not meet the criteria for a psychiatric hold and left him in the care of a family member. Officers returned to the home when, shortly before noon, Jones’ girlfriend reported to police that he had a gun. When officers arrived the second time, they heard three shots coming from Jones’ apartment. The gunshots did not appear to be directed at officers. One of the shots hit a car, but no one suffered any injuries. Jones barricaded himself in his apartment, and the standoff with police lasted about two and a half hours. During the standoff, police evacuated people from the neighborhood. Officers used an armored vehicle to approach the apartment and negotiate with Jones. The Atascadero man surrendered shortly after 2 p.m. When officers booked Jones in jail, they said they placed him on a psychiatric hold. Yes, and most likely he would have been eligible for Laura’s Law before this incident. The problem is that Anne Robin of the county mental health chooses to use prop 63 money that was intended to help people like this on social issues. I think the county BOS might be on to her. Listen to her on the Nov. 24 try and defend her position at the county meeting. Robin is doing everything she can do to prevent Laura’s Law from happening. She presented the board with highly inflated costs, which thankfully the board corrected her. Then she quoted herself and others that she works with as saying Laura’s Law would happen over her dead body because of her opinion of civil rights. She failed to mention that she is trying to use 2 million dollars of prop 63 to fund programs that won’t really affect who they were intended for. The seriously mentally ill.
Do the citizens of SLO county and the seriously mentally ill really have to suffer over Ann Robins and her crew believing they can do whatever they want. Here is the site that shows how people like Anne Robins wastes the Prop 63 money. in texas this man would have been deemed as test firing a new toy and would still be free. None of this is funny. The state of mental health in our county is pathetic–and human suffering is never a matter worth joking about. brainwashing and pandering are at epidemic proportions as evidenced by your mindset. Thats true, and sadly Americans would prefer to arm themselves more heavily than address the mental health problem…or perhaps they feel THAT is the way to deal with mental health…with the tragic results we are seeing with the number of gun related deaths.